﻿ Using Stones for Personal Growth. Peridot or Pyrite: Responsibility. 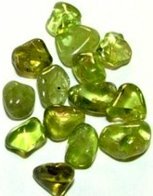 Peridot is a transparent greenish crystalline stone with a vitreous luster. Composed of magnesium iron silicate, it can range in color from yellow-green to olive green to brownish green, and because its most common color is olive green, it is also known as olivine. Important deposits are in volcanic rock in the Red Sea, Burma, Australia, Brazil, Arizona and Zaire. Peridot was especially prized by the Egyptian pharaohs who used it for personal adornment. In the Middle Ages it was brought to Europe by the crusaders and was often used for ecclesiastical purposes. Pyrite is an alternative and readily available stone that can be used instead of peridot, since it puts out the same type of subtle energy. Pyrite is a shiny gold colored opaque stone composed of iron disulfide. With its brassy yellow color and metallic luster, pyrite is often mistaken for gold, hence its other name "fool's gold". The name pyrite comes from the Greek word pyr, meaning fire, since sparks are caused if pyrite is struck with a hammer. 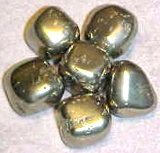 Pyrite is found in Spain, Mexico, Peru, Bolivia, Italy and USA, and has been used for making jewelry by many ancient civilizations, including the Greeks, Romans and Incas. The ancient Mexican Indians also made pyrite mirrors for divination. The crystalline structure of Peridot (or Pyrite) vibrates in a way that interacts with the Inner Being to strengthen Responsibility. Responsibility is the ability to operate your life in a responsible manner. It is the ability to take on commitments and carry them out. It is keeping your promises by following through on the obligations you take on. If you are a responsible person you are capable, reliable, conscientious and dedicated. Your word is your deed, and you almost always carry out the things you say you are going to do. You are self motivated, and you respond to what needs to be done, by doing it right and doing it well. And when you have done something well, you feel proud of yourself for being able to operate that way. You also feel proud of others when they act responsibly. Responsibility has both a doing side and a knowing side. The doing side is being able to take on commitments and successfully follow through and carry them out. The knowing side is knowing what commitments or obligations to take on and be responsible for. These two aspects of responsibility work together as a duality. This means that as you develop the ability to recognize what to take responsibility for, you also increase the ability to be responsible in general. As a responsible person, you know you can only take responsibility for things that are within your control. You know that taking direct responsibility for things outside your control would be a waste of your energy. For this reason, you only take on things you can handle competently, and you avoid taking on things you are likely to mess up. If something crosses your path that you feel you can not look after in a competent manner, you will do the responsible thing by not taking it on. Because you choose your responsibilities carefully, you are good at making things happen the way you want. If you have trouble being responsible, you are often not sure what kinds of things you are competent to do. You are sometimes careless in taking on things you are not good at, and you end up being unable to keep promises you have made. You also have trouble recognizing what others are capable of accomplishing competently, and you tend to trust people to be more responsible and competent than they really are. Before taking on a new responsibility, always ask yourself if you are capable of carrying it out. Learn to recognize what you can do competently, and what you can't. Look at your capabilities and limitations and see what feels safe to take on. If you only take on things you are capable of doing, you won't end up harming yourself or others through carelessness or negligence. By starting to consistently operate in this way, not only will you feel more confident in your ability to do things well, but you will also start to operate in a more responsible manner. You can also increase your level of responsibility by developing a passion or drive for the things you consider worthwhile accomplishing in life, and by dedicating portions of your energy to those things. Learn to become good at putting your energy and passion behind the things you really want to accomplish. Dedicating yourself to things you are passionate about will produce more worthwhile and successful results, and will make you a more responsible person. When you need to lean on others and accept their help, learn to use their energy in a responsible and careful manner so that you don't harm them by asking too much of them. Develop your awareness of the difference between what is reasonable to ask of people, and what is burdensome to ask. This will help you know how much you can lean on someone without taking advantage of him, and without wasting his energy unnecessarily. If you act irresponsibly by making unreasonable demands of your friends, they feel used, and that isolates you from them. The ability to know what you can ask without being a burden is an essential part of being a responsible person.